Two more pairs of socks have joined the Sock Family (or the Sock Project Completion List): a second and different green pair (whose brilliant emerald doesn't, alas, show up in these photos) and a turquoise pair. 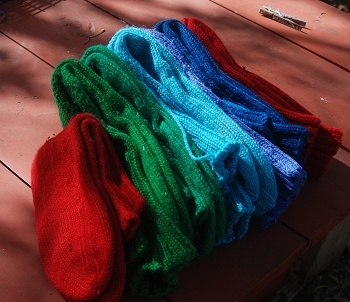 The first three pair--red, blue, then green--are in the back stack; the second three--red, medium or denim blue, and the other green--are in the front stack, and the seventh pair, the turquoise, are by themselves. You can tell that the left-hand red pair is shorter--it was the first pair, and there's not as much stockinette below the ribbing, so the ribbing looks shorter, though it isn't. They're also the largest in circumference. No two pairs are exactly alike, as I'm still experimenting a few stitches this way and that. Wearability--the first pair was worn twice a week (to allow for slow drying) until the second pair was done, and has sometimes been worn twice a week (always once a week) since then--from about the end of March to now. Each of the other pairs was immediately put into use after it was finished, so that I could wear hand-knit socks all the time. And they're fine, so far, besides being very comfortable. If I could still find 100% wool socks without elastic that fit me, I would not have the choice of colors shown here (or the other colors I plan to make: purple, yet another blue, etc.) I know some people don't find hand-knit socks comfortable, but my feet love them. The turquoise are my first foray into Superwash wool; I hand-washed them for their first wash and blocking, and will put them through the machine after the next wearing. Thanks. 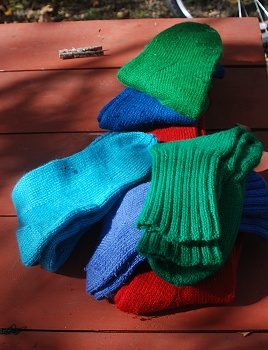 Violette Malan (whose books are wonderful, by the way, if you haven't read them) lives in Canada and says they need 14 pairs each "circulating" to have enough wool socks (partly because when handwashed they can take several days to dry in winter.) I'd like to have that many, of course, and by then will be trying cables on some, to see if I like them. And I want a pair of knee socks. I used to love knee socks, but nothing commercial fits my legs. But that will take a LOT of yarn, I'm thinking. I'm also wanting to do wrist-warmers. It may be that the leftover yarn from the socks (each of which takes most of a 100g ball of worsted) will be enough to make matching wristers. Or maybe not. I have enough turquoise yarn for another pair of socks, and yarn for the purple and several other colors as well. I have about 20 pairs -- the oldest of which are closing in on 10 years old -- and couldn't go back to wearing commercial socks. They're so much better-fitting as well as being great colours. Mostly I use machine washable sock yarn and with the exception of a couple of pairs that have shrunk, they do fine in both the washer and dryer. I've enjoyed watching your progress as a sock knitter. You've done really well. Thank you. That's high praise from someone whose socks are SO doggone good. What are your favorite yarn brands? Noro Silk Garden and Noro Kureyon have gorgeous colours, but I (and other knitters I know) have had issues with knots in the middle of the skeins spoiling the colour sequence. Opal hand dyed lasts really well -- One of my 10 yo pairs is Opal, and they still look almost as good as new. Regia is great too. My other oldest socks are Regia. Zauberball knits up a bit thin, but seems to wear well all the same. Trekking XXL is another very hard-wearing yarn. Louet is nice for solid colours. Again a nice machine-washable yarn. Patons Kroy is a bit thicker than most of the others I've listed, but it makes a lovely cushy sock. I've bought some yarns from Discontinued Brand Name Yarns the selection's a bit hit or miss, sometimes they have fabulous bargains, other times, not so much. I also buy sock yarn at sheep and wool shows -- you can get all sorts of beautiful stuff there that you can't easily find in stores or online. Thank you. I'm still doing worsted-weight entirely (thick socks suit my feet and my lifestyle) but I'll check each of these brands to see if they have something I want. Oh--I have some Noro yarn (bought on sale because it was just flat gorgeous and I had to) but it's very uneven in diameter and I don't think it would make good socks...I'm thinking I could knit a purse or tote out of one of the color combos, however, and maybe a shell (sleeveless top for summer) out of the other. It's a silk/cotton/something else I forget blend. I've never been to a sheep & wool show (not sure there's one anywhere near) but suspect I'd come home loaded with "stash beyond life expectancy." I was on a UK website (because a friend mentioned her yarn shop in Manchester) and saw the most gorgeous natural dark Welsh wool...and Shetland wool...and...so on. You can always make striped wristwarmers; or use one colour for the ribbing and another for the main part. Do you know the Cranford pattern? It's a very simple lace (10 stitches/8 rows repeat), the thumb increases are nothing short of elegant, and it can be done in one colour or a mix. I'm currently on - I think! - my 29th pair (for my sister's Christmas present). Oh - and it also helps to support Medecins sans Frontieres. I'll keep it in mind for when I want to make presents for others. Oh, I have big hands too, but the pattern fits me perfectly. Because it's lace, it stretches quite well. One way to enlarge it would be to add an extra 5 stitches and do two purls between each repeat instead of one. Or work on slightly larger needles - I use 2.5mm, but 3mm would make it bigger. But yes, it's wonderful for presents - I can knock out a pair in under a week by now. You can also stripe your socks, or do one section each colour. (Dad's socks took 3 balls per pair. Mom started at the top with something boring, then just as the heel was over she'd have to start a new ball. Pumpkin orange was popular. The saved yarn from previous socks will either be wrist-warmers or striped socks...I have in mind wildly and crazily mis-matched colors. Just for the heck of it. Witches with striped socks -- this may have become part of the conventional witch stereotype because in the Middle Ages stripes were worn mainly by the disreputable. (The same mentality that gave us convicts in striped suits). A French expert on various types of heraldry wrote a book called "The Devil's Cloth" illustrating this in considerable detail. Aha! Thank you! So the stripes would have had a social significance...now the question is, WHY would disreputable people wear stripes...and probably (my guess) because they were poor and putting together scraps of things. Or maybe their clothes were deliberately torn, and mended with other cloth? I'm going to do my niece's Christmas present socks that way; I've got no end of left-over sock yarn, so I'm just going to pick up a ball at random and knit the toe; pick up the next one for the foot, another for the heel, another for the leg (or maybe two...), another for the ribbing. And the second one will be totally different. Rule of thumb: one pair of knee socks, for average sized people, takes about as much time and yarn as two pairs of shorter socks. I'll wait until I've done all the shorter socks I need, then, before starting the long ones. If I have a break between Book V and whatever's next, then maybe I can get some inches onto the leg before I get down to the familiar part. The turquoise are my favourites so far. What a nice colour combination, altogether. Thanks. It is a very pretty turquoise color in that yarn. I use a wonderful sock book - Sensational Knitted Socks by Charlene Schurch (22 Aug 2005). She has written two books that I know of and each teaches you how to measure a foot and knit socks to fit. Additionally the book gives info for 4dpn, 5 dpn, and two circular needles for every sock described. It is layed out so that each chapter is for patterns with increasing number of stitches which repeat, some top down and some toe up. Check it out. Kelley. Thanks. I have a sock book she co-wrote with someone else--quite useful. That is a lovely collection of socks! I don't wear thick socks, but they are great. And I second the suggestion of wildly variegated stripey ones to use up left-over wool. Not "madness" unless you consider the acquisition of boxes of yarn madness, and hours spent knitting with the yarn madness--which you might. That's a cute yarn holder. There are now dedicated "yarn bowls" designed to hold (usually) a 50g ball of yarn, with a slot in the side so the yarn you're using will come out, and the yarn will stay in the bowl. I'm using (ineffienctly) a plain bowl to hold a ball of yarn as I try to rewind it from its bedraggled and tangled parent ball. The ball really does stay down in the bowl. So far.